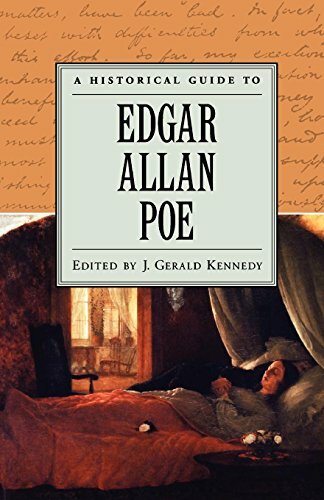 Amazon.com description: Product Description: Edgar Allan Poe (1809-1849), son of itinerant actors, holds a secure place in the firmament of history as America's first master of suspense. Displaying scant interest in native scenes or materials, Edgar Allan Poe seems the most un-American of American writers during the era of literary nationalism; yet he was at the same time a pragmatic magazinist, fully engaged in popular culture and intensely concerned with the "republic of letters" in the United States. This Historical Guide contains an introduction that considers the tensions between Poe's "otherworldly" settings and his historically marked representations of violence, as well as a capsule biography situating Poe in his historical context. The subsequent essays in this book cover such topics as Poe and the American Publishing Industry, Poe's Sensationalism, his relationships to gender constructions, and Poe and American Privacy. The volume also includes a bibliographic essay, a chronology of Poe's life, a bibliography, illustrations, and an index. About: Explores historical and biographical details of the writer's life, as well as the unexpected dimensions of his accomplishments and influence.